KUNG FU is our new development for combination bat player. The blade does - not - consist of Balsa wood. KUNG FU was specially optimised for use with our Anti-Spin and pimpled-out rubbers. It produces a very good spin reversal and disruptive effect since the ball can be returned very short and low over the net while blocking on topspin. KUNG FU is a bit softer and offers a slightly better control than our existing combination blade GLADIATOR however it also enables to produce a game that is just as effective. 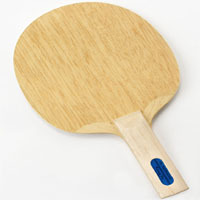 On the other side KUNG FU can be used for powerful attacking shots through hitting or looping (topspin).